Love traditional family run businesses? Then look no further as Fentimans has it all. What are Fentimans drinks? well they are a family run drink company who sell soft drinks and alcoholic drinks. Thomas Fentiman started the drink company within a small Yorkshire town called Cleckheaton. Thomas Fentiman was the founder of Fentimans when it all began back in 1905. He began as a iron puddler and provided a cash loan to a tradesman. For security he received a deposit and that was a recipe for Botanically Brewed Ginger Beer. The loan was never repaid so Thomas used the recipe he was given and started to produce Ginger Beer. 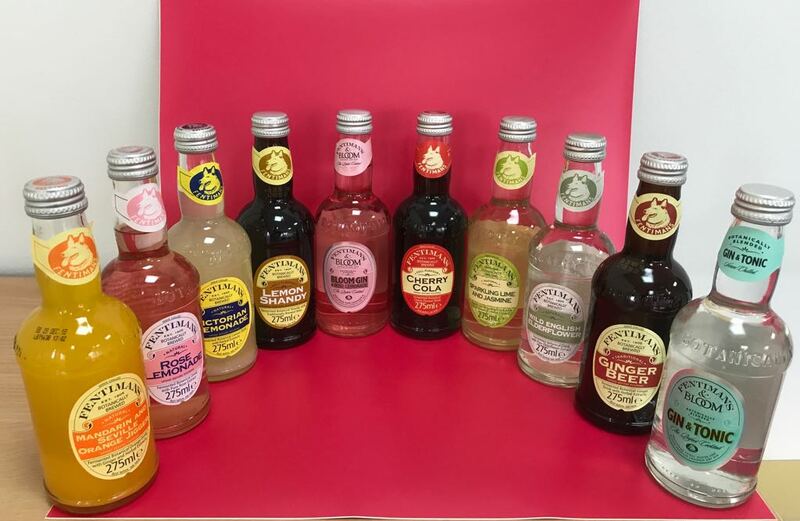 From then on Fentimans just has kept on growing and growing and has been a family run business from day one. His great grandson Eldon Robson is the current Chairman (2017). Fentimans is exported to over 70 counties and recently winning the prestigious Grocer Exporter of the Year Award (2017). From Ginger Beer they grew their range over time with so many award winning artisanal beverages including soft drinks, mixers and alcoholic Ginger Beer. How is the Ginger Beer created you may ask though considering this was the drink that made Thomas Fentiman and a success. From the original recipe back in 1905 he used the finest ginger root, bruised it, crushed it and milled it then placed into copper steam jacketed pans containing spring water and then gradually heated to simmering point. This released the ginger sediment and flavoursome botanical extract. The Botanical liquid was then filtered into a wooden vat. The finest herbs, natural flavouring, sugar and brewers yeast was then added to the botanical extract and the liquid was thoroughly stirred. The liquid was then left to ferment in the wooden fermentation vat. The live ginger beer was then decanted from the wooden vat into the iconic stone jars, known affectionately as ‘Greys Hens’, where it came up to condition and was ready to drink within a week. All their drinks are hand crafted though using the time-honoured Botanical Brewing process and takes a full 7 days to make any beverage using the recipes that have been passed from generation to generation. Ginger Beer, Victorian Lemonade, Rose Lemonade, Lemon Shandy, Curiosity Cola, Dandelion & Burdock, Wild English Elderflower, Cherry Cola, Mandarin & Seville Orange Jigger and Sparkling Lime & Jasmine. Premium Indian Tonic Water, Naturally Light Tonic Water, Pink Grapefruit Tonic Water, Botanical Tonic Water, Bitter Lemonade, Ginger Beer, Curiosity Cola, Rose Lemonade, Ginger Ale, Ginger Beer and Muddled Lime and Soda Water. I have always been a huge fan of Fentimans drinks from their Curiosity Cola to Rose Lemonade but I never knew that they sold alcoholic drinks. All of their soft drinks are all presented nicely in an old style fashioned bottle with a old style label with their drinks being full of fizz and always with a very refreshing flavour. With all the flavours they do in the soft drink range I never realised though that they sold a non-alcoholic Ginger Beer which is silly as this was the original and first ever drink that Fentimans made back in 1905. Anyway this was my first time in trying it and wow it did not disappoint it was most certainly fiery and spicy but tasted so good and looked amazing with its pale cloudiness. So if you love strong ginger and love beer then this is certainly one to have. It made me think of ginger and more ginger and more ginger whilst giving me a buzz. They also sell Lemon Shandy which is a beer and lemon lovers dream. This was my first time in trying Fentimans premade drink and it was delicious. I was totally blown away I felt like I had lept to a pub in Italy in Sorrento whilst drinking it with the lemon cestiness hitting my tongue plus with the beer being so smooth it made it a very pleasurable drink to drink. The Lemon Shandy is a great one and with it being under 0.5% alcohol content makes it a soft drink. Very refreshing. The other drink I love has to be the Wild English Elderflower which I only recently tasted whilst sailing down the canals on a Go Boat in London. This has to be one of the best fizzy Elderflower soft drinks I have ever tasted with it’s delicate floral flavour and the amazing fizz that just kept fizzing which gave a very nice sensation on the tongue when drinking it. It started to make me think of fields of elderflower and fairies dancing amongst the plants for some odd reason, just heavenly. My favourite soft drink though has to be the Rose Lemonade with its delicate sweet citrus flavour with a hint of rose and lovely pink colour with it always makes me think of a shepherds delight sunset for some reason. The alcoholic drinks as I mentioned earlier I never knew they sold alcoholic drinks so it was my first time in tasting the Bloom Gin and Rose Lemonade. Was really nice could really taste the hint of rose on my tongue and made me think of rose fields. I certainly will be looking out for this drink in the shops. So the question is which ones would you try from their vast range of pure delight. I have to say what struck me first was the Fentimans bottles which were colourful with really beautiful labelling. For some reason I also thought they were just non alcoholic but saw on closer inspection the range had a few alcoholic versions which was nice to see. I chose the cherry cola and the Victorian lemonade. The Lemonade was a little sweeter but not too much. Perfect for the hot day we had in the park. The cherry cola was subtle and tasty. I think I’d definitely buy some if I saw in a store and certainly venture to try an alcoholic version if I had he chance. All in all was impressed how nice it was to drink. I have always loved the Fentimans Ginger Beer, the spicy kick of the Ginger sediment, but I never knew they do alcoholic drinks, which are also gluten free! I tried some of the other soft drinks in the range such as the Mandarin & Saville Orange Jigger, the name itself takes you to the Mediterranean sunshine. The drink consist of 50% mandarin juice which is further enhanced with mandarin oil and did you know it also has a hint of ginger within? When you are bored of drinking just water and the standard fizzy pop just don’t do it for you? Then head over to the refrigerator section of your local supermarket and pick one of these up and quench that first of yours! Ever since discovering G&T I have been a huge of Fentimans tonic (especially the pink grapefruit) and was thrilled to find/try more of their soft drinks at Junipalooza this June – particular favourites including rose lemonade and elderflower. I am now so excited to discover Fentimans newest alcoholic range especially the rose lemonade and bloom gin drink – perfect over ice on a hot summers day. Looking forward to trying their ginger beer! OK, I have to say that the gin in the G&T portion is much less than in my usual intake but it was a good social drink. It definitely is better served chill. We took it on our Go Boat picnic adventure and it had just the right amount of booze for the boat (there is a limit of booze you can take on the boat). If you have the time, take some garnish! The lemonade was a little sweet for my palate but goes surprisingly well with crisps. I would definitely consider it as a drink for outdoors. I’m now a huge fan of the Fentimans G&T product. It was the perfect accompaniment to canal boating around Paddington. Fentiman’s Ginger Beer is really good! Fentiman’s Traditional Ginger Beer. I found it to be very fizzy, not too sweet but with lots of heat that hits you at the back of your throat. I’m usually a drinker of Jamaican Ginger Beer so this was a lot different to that. I couldn’t taste a lot of ginger, just the heat you get from it. To be honest, I didn’t think much of it on it’s own so I thought I’d try it as a mixer as I’m guessing that’s what it’s being marketed as. I mixed it with some Blackwoods Premium Vodka and the ginger beer was lost. It couldn’t stand up to the vodka taste. Perhaps it’s just my taste but I probably won’t have it again. This was my first time trying the varieties, and I didn’t know how many they had and that some were non alcoholic. I preferred the pink grapefruit gin ace tonic the most as it was sweet but also a little sour. The standard gin and tonic was also nice. I really love ginger beer so I look forward to trying that as well. I had the opportunity to drink these in a hot tub floating down a canal, so it was the perfect situation!